Downtown Fort Saskatchewan is like no other place in Canada. The core of our city has deep roots in law and order and industry and it is situated next to a beautiful natural area, the North Saskatchewan river valley. Downtown provides Fort Saskatchewan with an identity and is a place of pride. It is the focal point for community celebrations like Canada Day and likely one of the first stops for a first time visitor or an investor looking to expand their business. A healthy and vibrant downtown is important to maintain for generations to come. The Economic Development department is spearheading a public engagement opportunity to focus on Downtown as a neighbourhood with opportunities for residential, commercial and social success. “We are looking to have a productive discussion on what we want our downtown to be, an how we might make some decisions in the next three years to really see some impacts on the face of downtown,” stated Mike Erickson, Economic Development Officer. The workshops will take place on Friday March 1 from noon until 4 p.m. and the same session will be held again on Saturday, March 2 from 9 a.m. to 1 p.m. to provide residents some options. The registration is through Eventbrite and can be found at vibrantdowntown.eventbrite.ca or you can call and register at 780-992-6232. Refreshments will be served and the sessions will be facilitated by Intelligent Futures. “We plan to have recommendations and action items to City Council before the end of 2019,” continued Erickson. “That being said, if an idea emerges that is impactful and feasible to execute in the immediate future, we’ll move forward with it,” he concluded. 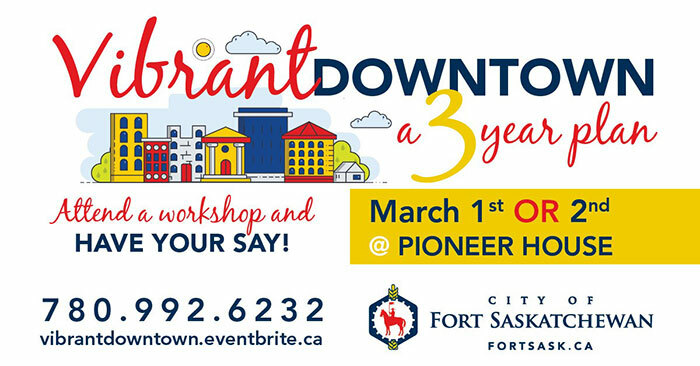 For more information or to register, visit fortsask.ca/VibrantDowntown or sign up at vibrantdowntown.eventbrite.ca.